Update: The restaurant has been taken over by Alain Ducasse after the recent departure of Chef Yannick Alleno. 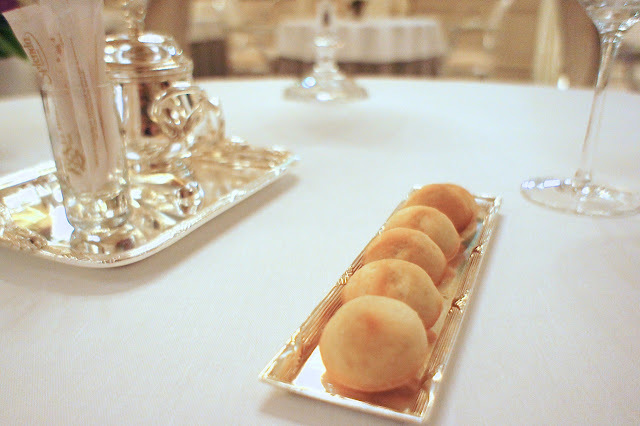 Le Meurice is a 3-Michelin star french restaurant in Paris, located in the legendary Le Meurice Hotel along Rue de Rivoli across the road from the Tuileries Gardens. 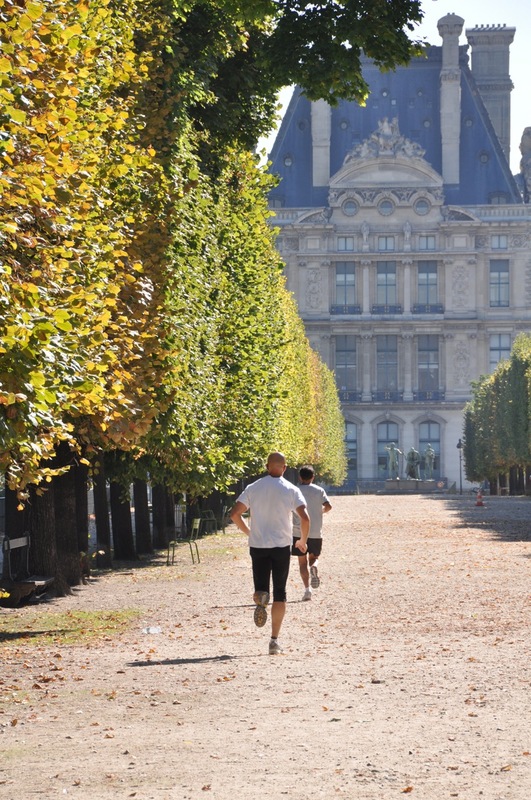 Write-ups of Le Meurice mention the fact that the restaurant overlooks the Tuileries Garden, although in actual fact, the only thing you would be able to see are the hedges surrounding the Garden (if you can also overlook the traffic on the very dusty Rue de Rivoli which runs between the restaurant and the Garden). Nonetheless, in a dining room like this, there is really no reason to be looking outside: everything in the restaurant, from the classical wall art, glittery chandeliers, gold-trimmed tableware to swankily dressed waiters and waitresses, was a visual treat. 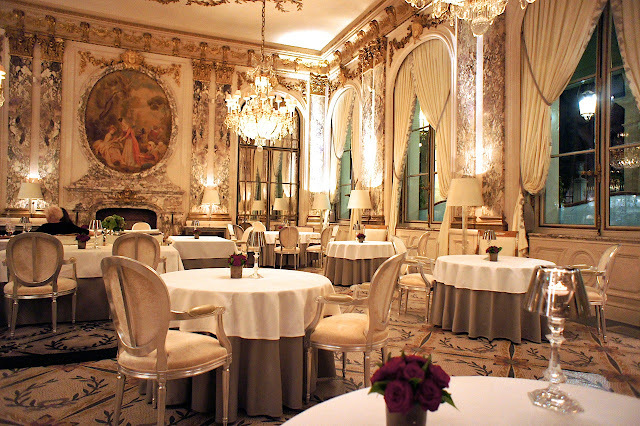 The dining room is very grand, with Renaissance-painted walls and ceiling; having a meal here is like eating in Marie Antoinette's dining room. The tables here are very well spaced, and despite the feeling that you are dining in a large hall (due to the very high ceiling), you are seated far enough from the next table to ensure that you are not overheard. We were warmly welcomed by the Maitre d' with champagne, followed by some amuse bouche of cheese pastries and something with jelly. 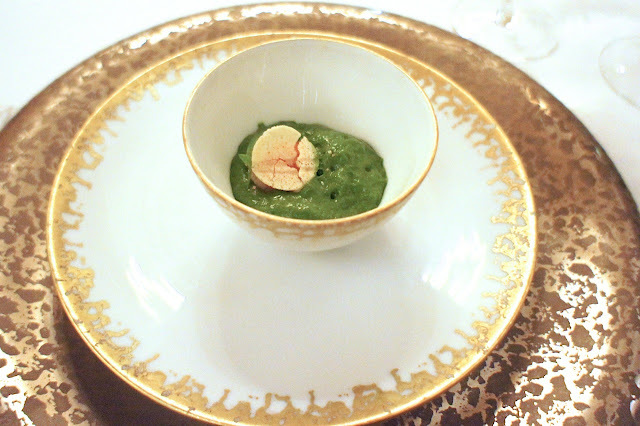 Interestingly, amuse bouche was accompanied by a finger wash bowl (the type you would expect to see in a Singapore seafood restaurant which you would use after utilising all 10 fingers to eat the chili crab). I would not have expected guests in Le Meurice to be using their hands to eat (seemed more likely that one of the waiters would feed you instead). We would see this finger wash bowl in other restaurants in Paris as well so it isn't that rare, apparently. We asked for assistance with the wine and the very friendly sommelier suggested the 2004 Gevrey Chambertin, Vieilles Vignes from Charlopin Parizot. 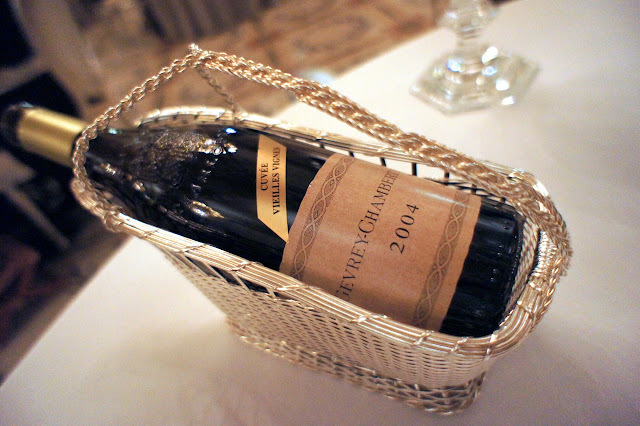 It was a good bottle of wine, but I felt that it was rather expensive for what it was. 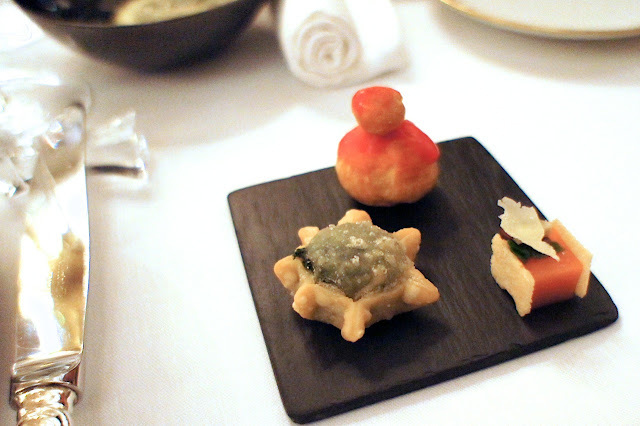 Prior to the start of our meal (we opted for the degustation menu), we were served with a spinach foam with foie gras sandwiched between 2 wafers. It was very light and tasty despite its less-than-inspiring looks (the foam was moss-green). The first course was absolutely fantastic: it was the delicate jelly of turnip broth with yuzu, surrounded by sea bass tartar with iodized seaweed. It felt strange to be having a dish so Japanese in a dining room so classical french, but mix of flavours between the rawness of the fish, the sweetness of the yuzu (Japanese citrus fruit) and the savoriness of the seaweed was sublime. 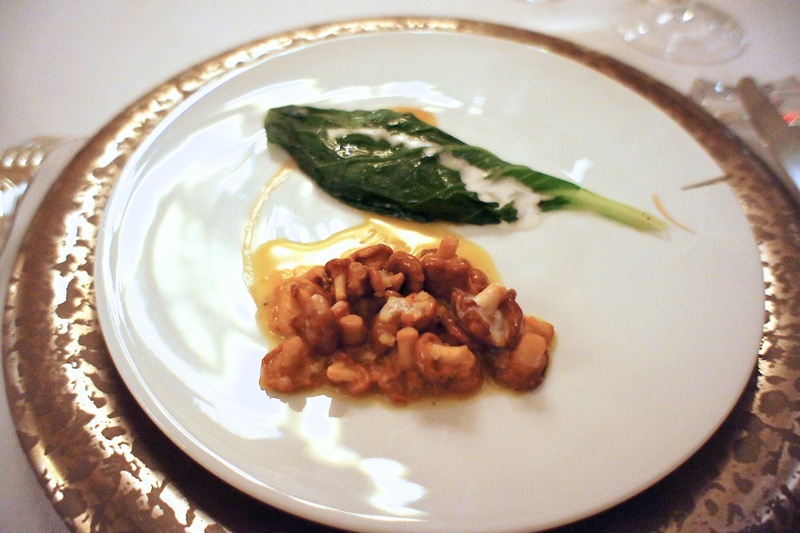 This was followed by the chanterelle mushrooms with vin jaune, stuffed romaine salad leaf (stuffed with caramelised onions) and veal juice with nut-brown better. It was a very simple dish but was very well put together. Next was roasted duck foie gras with mango juice and spiced thin biscuit. 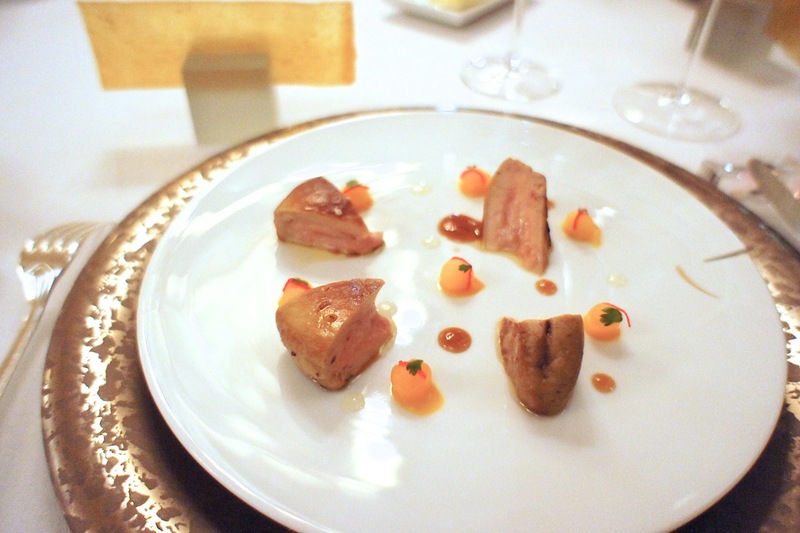 This was a delicious dish, and mango proved to be a very good complement to foie gras. 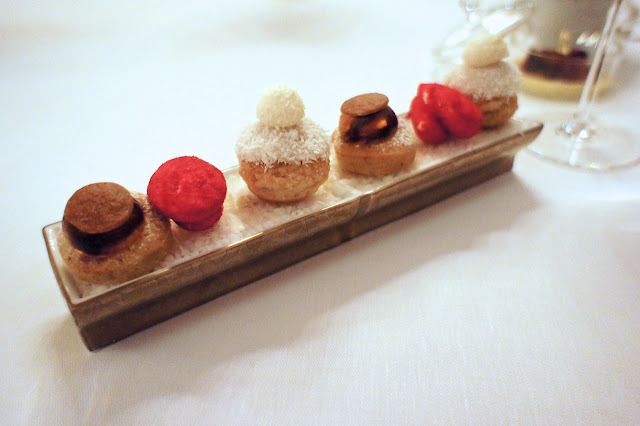 The foie gras itself was roasted lightly to perfection and it held its texture well. 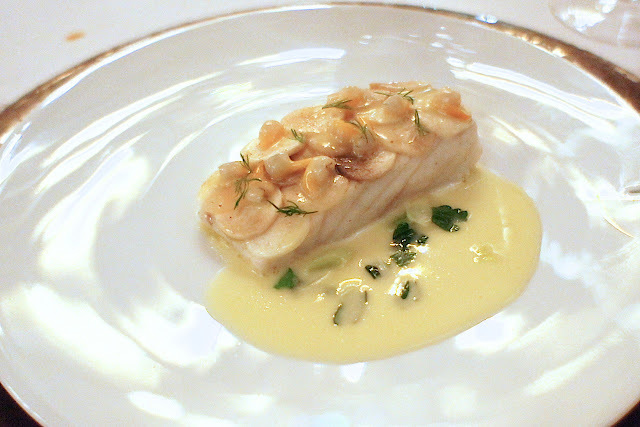 Then came the best turbot we had ever eaten; fillet of turbot braised with thinly-sliced Parisian mushrooms, with juice of soup herbs. The turbot was absolutely amazing, and the mushrooms (which according to the chef were cooked while on the fish), bits of clams amongst the mushrooms and sauce made this probably the best fish dish we've had in a european restaurant. This would be the gold standard against which we have compared all other fish dishes we have tried. For the mains, I opted for the chef's specialty: Scottish grouse with aged malt with buttered rat potatoes. 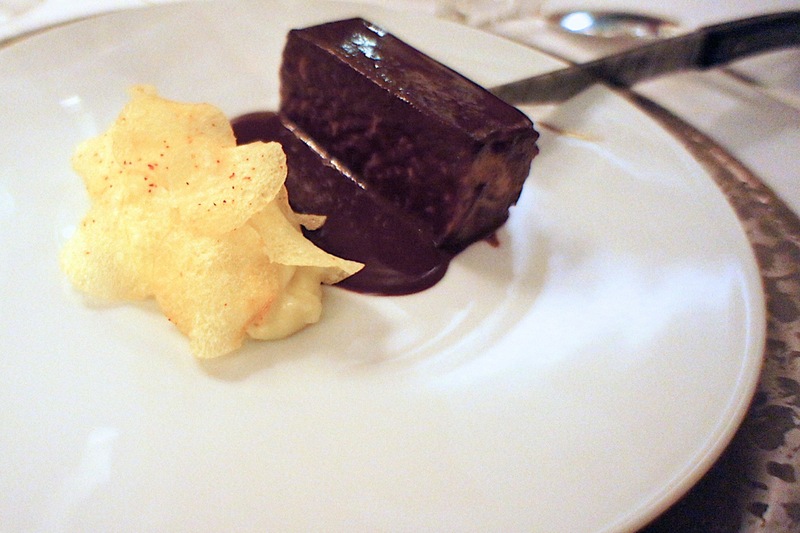 At first glance, it looked like an inappropriate dish of dark chocolate cake with potato chips. However, the grouse had a deeply rich and complex flavour, accentuated by the bitter malt sauce. I had never eaten anything like this before, and I was glad I tried it here. 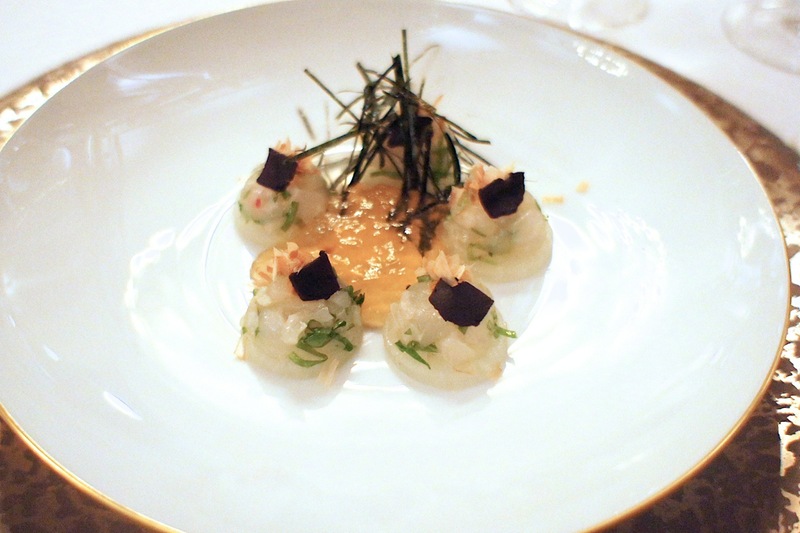 It was a dish which gave this meal an elevated level of sophistication. My wife chose instead the 'safer' option: larded fillet of beef marinated with seaweed jam, stuffed polenta with soft fresh cream and braised vegetable compression. It was also excellent and she loved it (she took a bite of my grouse and didn't like it very much though). 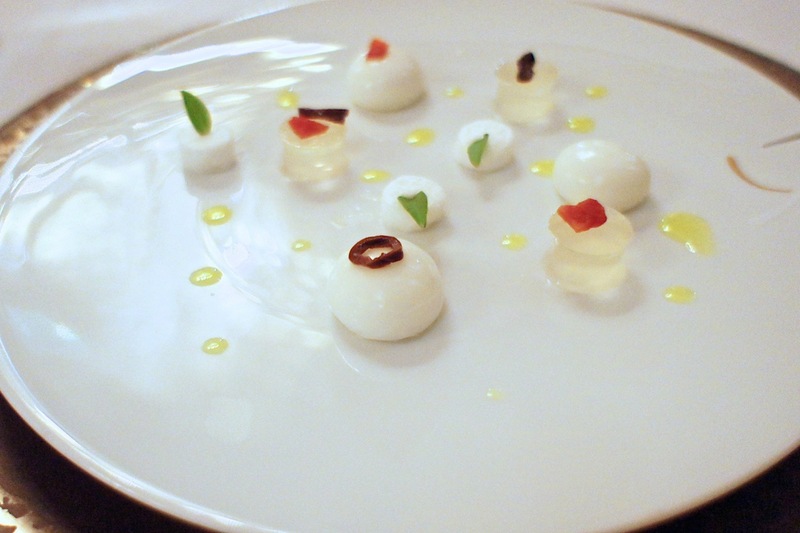 Cheese course had a very modern take: tomato and mozzarella with basil 'in a modern freshness style'. It looked and tasted more like a dessert than a cheese course, which was just what the doctor ordered after a very heavy main course (my grouse in particular). The soft and delicate mozzarella went perfectly with the sweet and juicy tomato jelly to give a very interesting interpretation of the cheese plate. Petit four came in a variety of tarts and marshmallows (the marshmallow was covered with rose petal shavings, which tasted very unique). 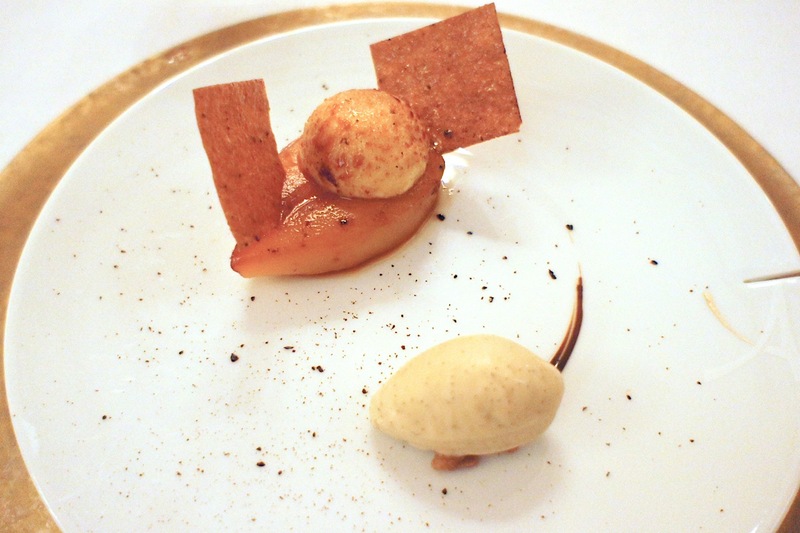 The first dessert was roasted pear hearts with caramel and liquorice, vanilla chiboust cream and crunchy 'arlette' biscuits. 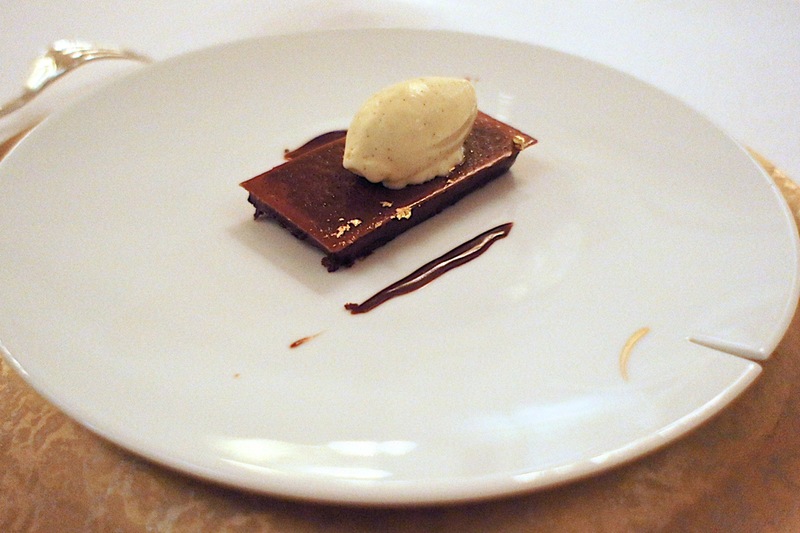 The second was warm soft chocolate mousse cake with bourbon vanilla ice cream. Both desserts were excellent. By this time, it was 1.30am (we started dinner at 8pm) and again we were the only guests left in the restaurant. Fortunately, we were also guests at the hotel so we could simply drag ourselves upstairs and into our bed. At that point, as much as the madeleines looked delicious, we just could not eat any more. 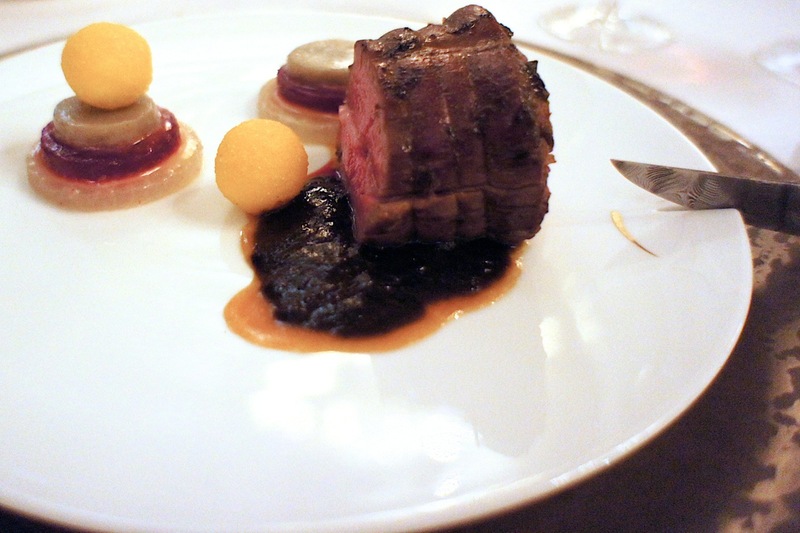 Nonetheless, it was a superlative meal and we did not expect to have such a modern and innovative meal in such a classical french dining room. A word on the service: Bravo. We have never seen a posse of waiters and waitresses who, in addition to being meticulous, also clearly had pride in their work. The level of attention by them and intuition to anticipate the guests' needs were second to none. You'd look up and they'll appear at your side to ask if you need anything. At the next moment, they are back standing a respectable distance from your table to give you your privacy. They would literally glide gracefully across the dining hall and when they present food on your table, do so with impeccable timing. You can only expect such standards of service at the top restaurants, and this was the best of them. Final Thoughts: A superlative dining experience, from the grand and inspiring dining room to each and every dish which was very innovative and well executed (the turbot was in particular memorable). But this could be a 6 hour dinner so best to go there hungry (a jog in the Tuileries Gardens beforehand is one way to build an appetite). Being a 'hotel' restaurant, it suffers from an overpriced wine list but other than that, it was like having dinner in a place which was cross between the Versailles and the Sistine Chapel and for the 5 hours we were there, we were treated like King Louis XV and the Pope all rolled into one. Love the decor of the place! And I really thought the bird was actually a slab of dark chocolate cake!